WIN $1500 in The Great BIG Giveaway! 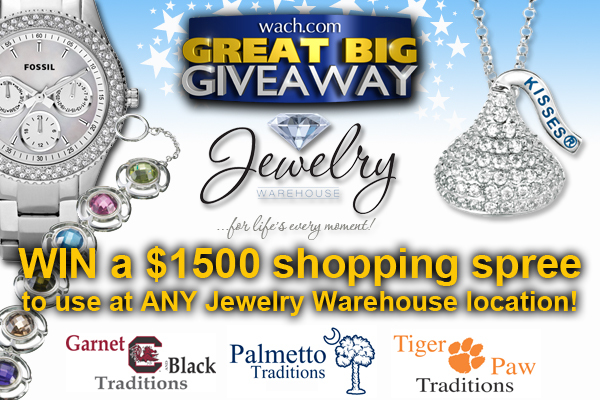 Win at $1500 shopping spree for ANY Jewelry Warehouse location: Jewelry Warehouse, Palmetto Traditions, Garnet & Black Traditions or Tiger Paw Traditions! You can find that big ring, fashion with a Palmetto flair, or items to cheer on your favorite team. Contest opens Monday, August 13. Winner will be chosen on Thursday, August 23. Click here to enter! This entry was posted in Contests and tagged contest, contests, shopping spree, the great big giveaway, wach fox, wach fox 57, win $1500 shopping spree, win a shopping spree. Bookmark the permalink.